Grove Team Keller Williams: What Kinds of Flooring Work Best in Family Rooms in Keller and Grapevine? What Kinds of Flooring Work Best in Family Rooms in Keller and Grapevine? We interviewed two flooring experts in North Texas to discuss the choices home buyers and homeowners are making in flooring for the family room. We contacted Brett Headland of All Pro Floors and Scott Gaulden of Simmons Floors and asked them about their clients' reactions to different types of flooring. Whether you are updating to sell or to occupy a home, much can be learned from the decisions other shoppers are making. Scott Gaulden expressed best what both know: "Wood floors drive our business." Homeowners who might have purchased a home with carpet are updating with wood. Those who bought homes with wood are sanding and refinishing their floors. Brett Headland expressed the same sentiment: "With the availability of engineered hardwood, hardwood floors are more accessible than ever when looking from a financial or maintenance point of view." 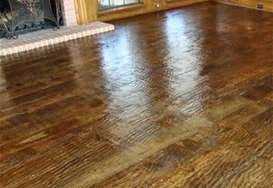 When I asked about wood floors and pets, both agreed that purchasing a handscraped finish presents one of the best choices in genuine wood flooring. The handscraped finish hides flaws and scratches better than a glossier finish. Engineered wood flooring may also be an option because a plank can be easily replaced. Engineered floor does have limits when refinishing; the ability to replace a plank can offset that drawback. Fewer and fewer North Texans are choosing carpet for family rooms in the middle to upper market. Wood floors--whether engineered or genuine--continue to take the majority of the market. Homeowners here appreciate the easy maintenance and rich look of wood. Additionally, allergy sufferers enjoy a choice between carpet and tile. Since flooring remains one of the most expensive elements of a home, both Gaulden and Headland encourage homeowners to test the appearance of the floor at night and in the daytime. You can call Scott Gaulden and ask that he send a mobile showroom to your home, while Headland offers a more traditional retail store at Davis and FM 1709 in the Hobby Lobby shopping center. Brett Headland of All Pro Floors can be reached at 817-442-9828 or at www.allprofloorstx.com. Email him at BrettH@allprotx.com. Scott Gaulden of Simmons Floors can be reached at 817-479-9719 or at www.simmonsfloors.com.